Calciphylaxis is a severe condition associated with chronic kidney disease. We describe a rare case of non-uremic calciphylaxis in a 79-year-old woman with prosthetic aortic and mitral valves, chronic kidney disease and anaemia, who presented with painful skin lesions on her left leg. She was taking warfarin, calcium and iron supplements, and had been recently diagnosed with oligoarthritis and started on prednisolone, all factors associated with calciphylaxis. Despite treatment, the lesions rapidly progressed to large ulceration and sepsis, and pain management was challenging. Calciphylaxis was confirmed following a second skin biopsy but the patient died from septic shock and multi-organ failure. 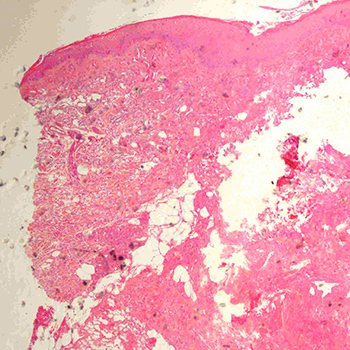 This case highlights the challenges associated with the diagnosis and treatment of calciphylaxis despite a high level of suspicion. Nigwekar S, Thadhani R, Brandenburg V. Calciphylaxis. New Engl J Med 2018;379:399–400. Brandenburg VM, Cozzolino M, Mazzaferro S. Calcific uremic arteriolopathy: a call for action. Semin Nephrol 2014;36:641–647. El-Azhary RA, Patzelt MT, McBane RD, et al. Calciphylaxis: a disease of pannicular thrombosis. Mayo Clin Proc2016;91:1395–1402. McCarthy JT, El-Azhary RA, Patzelt MT, et al. Survival, risk factors, and effect of treatment in 101 patients with calciphylaxis.Mayo Clin Proc 2016;91:1384–1394. Brandenburg VM, Kramann R, Rothe H, et al. Calcific uraemic arteriolopathy (calciphylaxis): data from a large nationwide registry. Nephrol Dial Transplant 2017;32:126–132.